A pattern is emerging with poker players who join the IveyPoker.com roster coming sown with a case of the “tournament run-goods”, and a recent string of success for IveyPoker.com sponsored pros like Dan Shak who was victorious at the Party Poker Premier League and Allen Kessler who won a preliminary tournament at the WSOPC Blackhawk has boosted the site’s visibility as the highly anticipated social media launch nears. 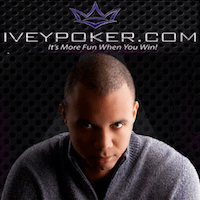 With a stable of over 30 poker pros on their roster, Phil Ivey’s eponymously named online poker room/site IveyPoker.com always has a good chance of one of their players making a deep run in a tournament, but since their signing bonanza began some six months ago the site has seen its sponsored players exceed all expectations. The first boon for the site was its decision to ink Greg Merson to a deal just before the WSOP Main Event final table began last October. Merson would of course go on to win the Main Event, bringing massive amounts of attention to the IveyPoker.com website even though the site was only in a beta-launch phase! Following Merson’s win the site signed a string of players, from big name pros to online grinders. One of the players signed by IveyPoker.com was high-roller Dan Shak, who joined the Ivey Poker roster during his final table run in the $100k Super-High-Roller event at the PokerStars PCA. Shak has been on fire ever since, capping off an impressive start to 2013 with a win at the Party Poker Premier League VI, and positioning himself as one of the favorites for Player of the Year honors. The latest signing by the site was one of poker’s cult figures, Allen “Chainsaw” Kessler. Kessler is both applauded and ridiculed in the poker world for his constant crusades against the smallest of issues in the poker world –everything from steep level jumps in tournaments to food comps is on Kessler’s “watch list”—and for his uncanny ability to sneak into the money and book min-cashes. But at the WSOPC Blackhawk tournament series going on in Colorado Kessler bucked his min-cashing ways and took down one of the preliminary events, Event #11, a $580 No Limit Holdem tournament that saw Kessler pocket over $20,000 in prize-money. The news caused some on social media to ask Kessler is Phil Ivey taught him to go for the win instead of trying to outlast the money bubble. This is Kessler’s second WSOPC ring. IveyPoker.com is currently operating as a training site, having bought the online poker training site Leggo Poker and rebranded it as the Ivey League, but the full potential of the site has yet to be realized. Eventually the plan is to turn IveyPoker.com into a combination social media online poker room as well as the current subscription-based training site; a move many see as a preliminary step to creating a real-money online poker room in the US when legislation allows.